Caution and timidity have been the ruling traits of Houston’s commercial real estate market for the past three decades. 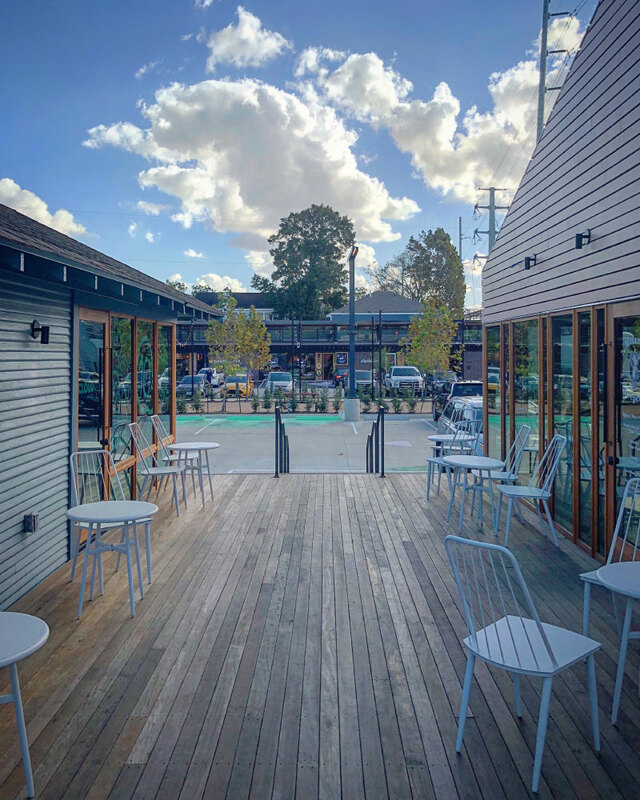 But, in the last few years, local developer Steve Radom and his team at Radom Capital have been working almost single-handedly to bring architectural sophistication back with their recent series of commercial developments. From the 1970s through the mid-1980s, Houston was an international architectural mecca. During these years, developers famously competed with one another to commission the best architects to design ever more sensational projects in a crowded real estate market. Then, a collapse in oil prices wrecked the city’s economy. In the decades since, with its high-flying developers grounded, Houston’s architectural scene has stubbornly trailed that of its nearby neighbors, Austin, San Antonio, and Dallas. The recent fracking oil crash has only exacerbated the situation. Even Gerald Hines, Houston’s greatest modern developer, has turned away from the outstanding architecture that brought him fame and success. Today, his buildings are tasteful, yet completely unremarkable. 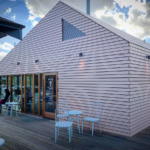 In this milieu, Radom’s commercial retail projects are noteworthy. Radom and his team commission talented architects on the basis of their design excellence. They insist on rigor and quality in concept and execution. 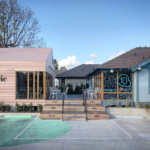 Rather than follow an established set of safe but boring development rules, their projects cleverly reimagine the most banal of building types: the strip mall. The results are exciting. 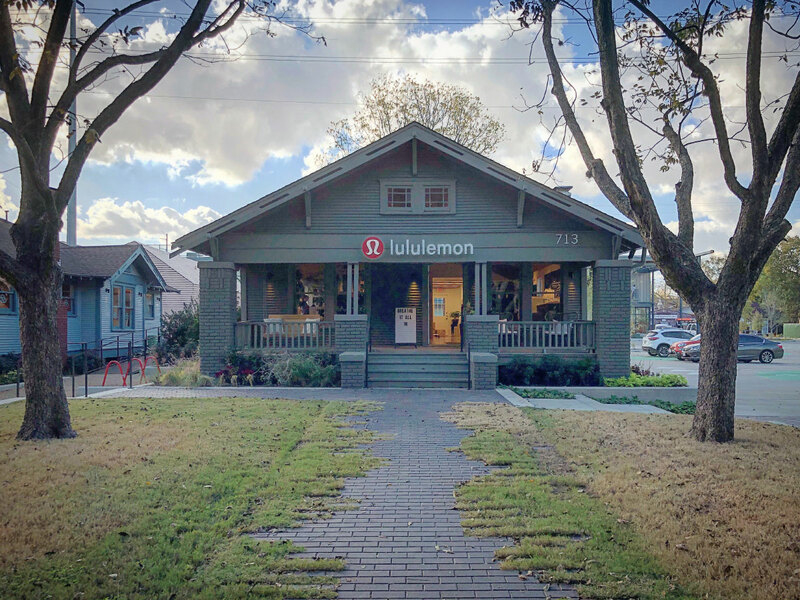 The fact that they have leased immediately in Houston’s unsteady economic climate demonstrates again that good design is a good business practice. Radom’s largest project to date is Heights Mercantile, a low-rise retail center partially located inside the Houston Heights Historic District a couple of miles northwest of downtown. 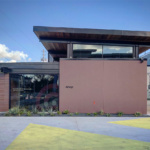 Austin-based Michael Hsu Office of Architecture designed the shell-and-core build-out and some of the interiors. 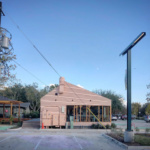 Up-and-coming Houston architects Schaum/Shieh and Content Architecture designed additional interiors. The Houston branch of the international SWA Group was the landscape architect, while Houston-based graphic design firm Spindletop devised the graphic identity. Heights Mercantile includes a mixture of six new and remodeled buildings—two of which are protected historic landmarks— spread across eight properties that were acquired in four separate transactions over a 14-month period. From 1967 to 2007, Pappas Restaurants, a local restaurant group, used three of the existing buildings as their headquarters. Two of the former Pappas buildings were remodeled to include a suite of shops and a wine bar. 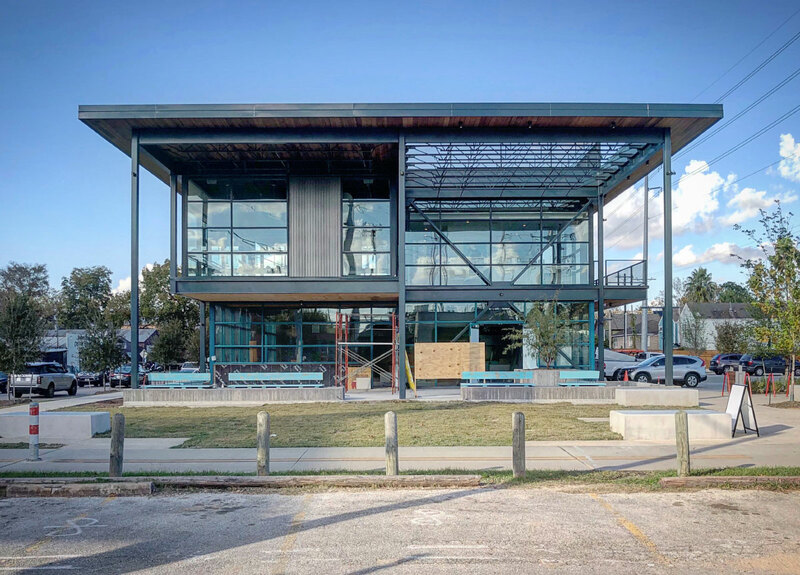 The third Pappas building, a one-story prefabricated metal warehouse used for cold storage, was demolished and replaced by a two-story building containing retail and restaurant space on the ground floor and a fitness club and offices on the second floor. The two protected historic buildings are one-story wood frame bungalows. They were converted into a clothing boutique and an ice cream shop. A small one-story wood frame building was built behind one of the bungalows and houses a cafe. Although Houston lacks zoning, it has other methods of land-planning. Among the most onerous are its excessive off-street parking requirements, which forced the design team to be creative in organizing the site. By reusing instead of replacing the Pappas buildings, the developers were able to maintain the existing, but now illegal, head-in parking. The bulk of the additional required parking was fitted between the bungalows and the new two-story building. 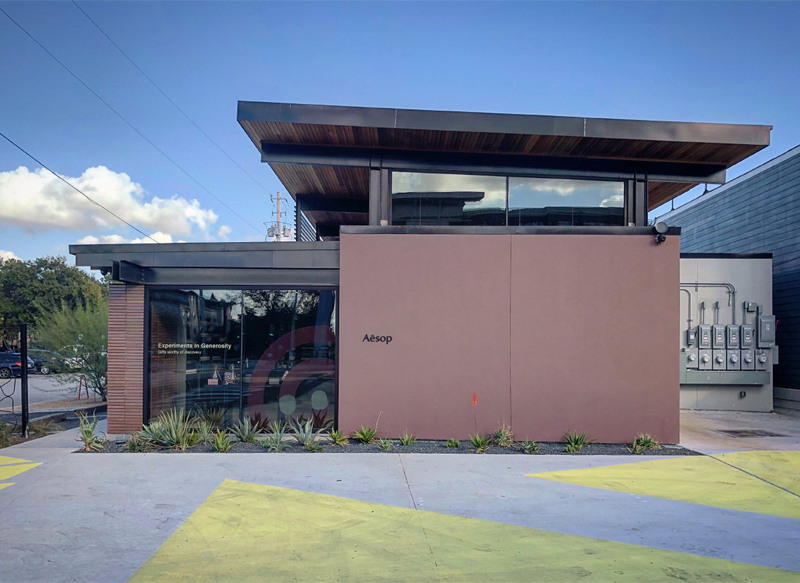 According to the developer, the city requested that the final property Radon bought directly north of the bungalows facing Heights Boulevard be devoted completely to parking. Fortunately, the 140 parking spaces do not overwhelm the development, thanks to creative landscape and siting decisions. 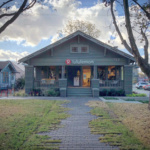 Houston Heights, like the city of Houston, is a tattered collection of heterogeneous residential and commercial buildings. Platted in 1891 as a streetcar suburb, it actually contains very few pre-1900 Victorian houses. What remains of its historic architecture is mostly Queen Anne worker cottages from the 1910s and bungalows from the 1920s and ’30s. These are interspersed with garden apartments from the 1960s and ’70s and the occasional one or two-story postwar commercial building. Up until 2010, when the city’s preservation ordinance was changed to prohibit demolition in designated historic districts, the last Queen Anne cottages and bungalows were quickly being replaced by townhouse developments and lot-filling faux-Victorian houses. 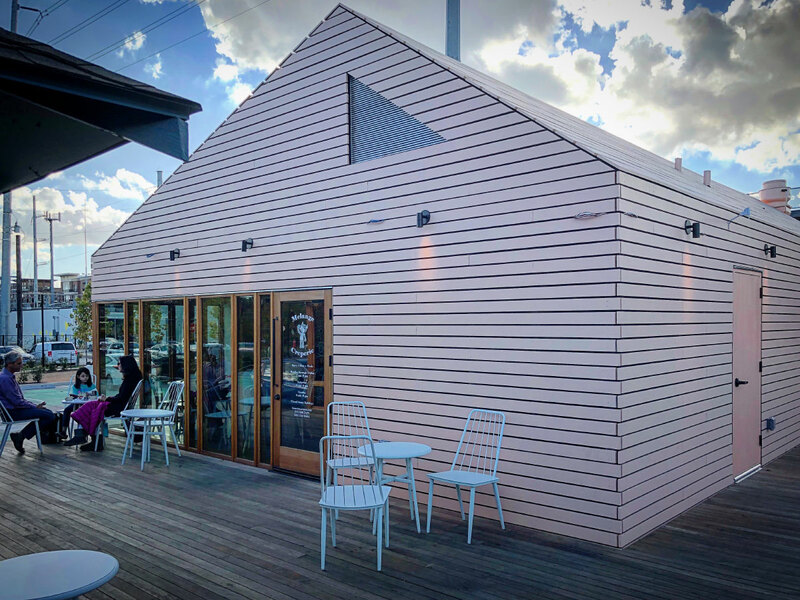 Heights Mercantile wittily addresses its motley neighborhood by providing its own assorted mix of buildings. 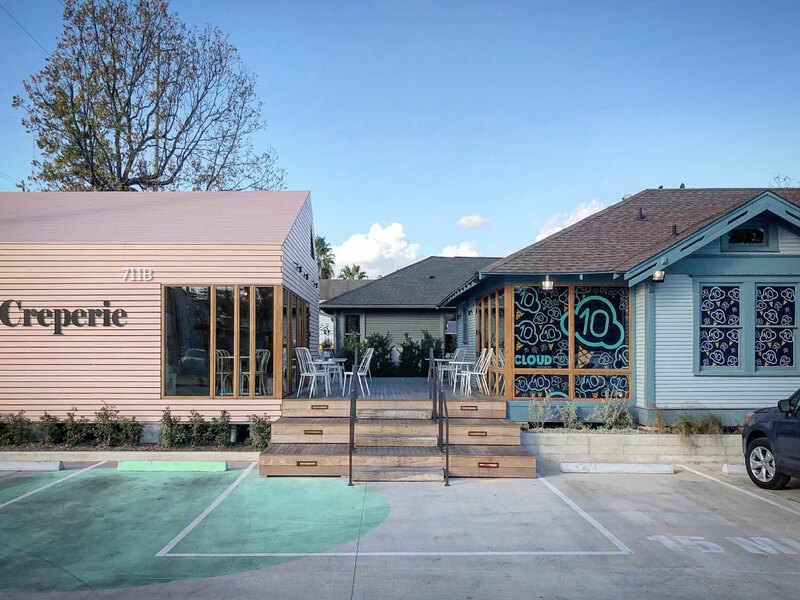 Rather than replicating the same building across the site, as most recent strip developments in and around Houston Heights have done, the architects consciously worked to make each building look and feel different. 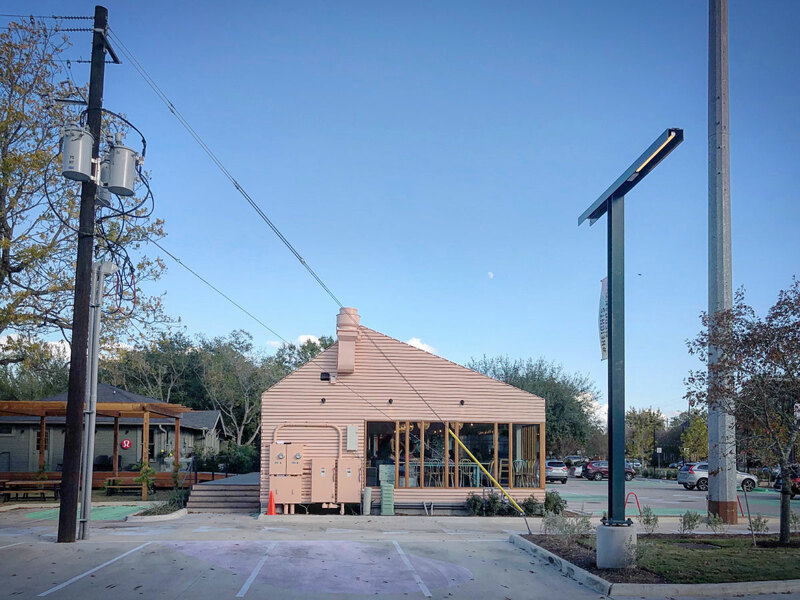 Furthermore, they casually spread them across the site, which is split up in a very ad hoc Houston manner by an active street, a popular hike and bike trail, a drainage easement, and an abandoned alley. The results celebrate the mess that is Houston. And, along with some clever landscaping interventions, they feel inviting and fresh rather than chaotic and dreary. If this is the vision Radom and his team want to promote for Houston, then I’m all for it. And judging from its completely filled lease spaces, so is the real estate market.